"Haché is a family business founded in 2004, our priority is simply to offer our customers the best of everything. We use only the finest Scottish beef and all the food we serve is delivered fresh daily. We aim to deliver a winning combination of delicious burgers and a friendly service in a romantic setting. Our mission is to create the best possible ‘Haché experience’ for all concerned- both our staff and of course our customers!" This is one of my favourite restaurants without a doubt. I've come often enough that I'd say I've tried well over 50% of the dishes and I'm yet to have a bad meal (that being said, I didn't LOVE the Steak Louisiana burger but that's just me) and the sides are absolutely delicious. I'd recommend the sweet potato frites & the chicken wings. As for mains the Steak Catalan is maybe my favourite but really there are too many I love to list them all. Definitely give this place a go if there's one nearby. Bodeans was full and was very hungry so had no choice but to go to Hachè. I have never been there before but when the waitress called me 'love' which I can't stand I almost turned around and walked out. I don't appreciate street jargon anywhere let alone places that are trying to be posh. .. And somehow I had a feeling that it is exactly what this place is trying to be. Anyway onto the food. I ordered a cheeseburger, that didn't come with chips and had to be bought separately which I thought was a complete robbery and onion rings. The burger and chips were nice but nothing you can they anywhere else. The onion rings were huge and hard- not cooked through properly so I could not eat them. Would I go back? No they added service charges £3 and a donation of £1 to my bill without asking me which then fired the final bill up even more. £20 for a burger nah I don't think so. On the other hand I would recommend the place to couples and for dates because it did look pretty with fairy lights and stuff most girls like ?! Haché is the new player on Clapham High Street, and it’s already elbowing its way into the hearts – and stomachs – of Claphamites. Haché (pronounced 'ash-eh') is a rare example of a chain restaurant that has paid close attention to its aesthetic. Space on Clapham High Street is rare and so they've sandwiched themselves into a rather small, long room that could easily have been a disaster. However, with some clever design features, they make it work. The seating is, admittedly, a little cosy, with tables for two pushed against one wall, and a few larger tables dotted around, with a bar sitting on the other side with a few high stools. Luckily, they have avoided any feelings of claustrophobia thanks to a multitude of mirrors, some vibrant lighting and a bright white colour scheme that highlights a period ceiling complete with wooden beams. Several chandeliers hang from above, complemented by twinkling fairy lights, while a few plants and pretty artworks complete the look. There's also calligraphy covering the walls, saying things like ‘what in the world are they saying about Hache?’ next to a picture of a world map. 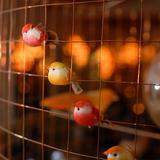 It’s quirky and gives the place some individuality, even as part of a growing chain. Haché is already attracting the locals, and happily avoids some of the trashier elements that invade Clapham High Street every Friday and Saturday night - they seem happier at McDonalds opposite. This is a place with a sense of style and sophistication, which is no mean feat for what is, essentially, a burger joint. 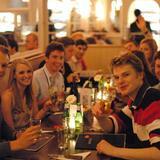 And the whole feel of the place is helped by friendly staff who give it the air of a more upmarket restaurant. 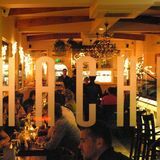 The burgers at Haché are excellent and although they’re not the cheapest, they are in line with other high-end burger venues. The menu is succinct and concentrates on what they do best – big, fat burgers. The Steak Louisiana (£8.95) is highly recommended, with a big beef patty (cooked to specification) served on a ciabatta bun (ooh posh) with rocket, onion, tomato and their ‘special’ Haché mayo. Oh, and don’t forget the cheese and American crunchy peanut butter. Yes, seriously. It sounds crazy but it works, and you’ll soon be wondering why you haven’t always enjoyed peanut butter on your burger. The crunchiness of the nuts gives it a pleasant texture and the sweetness highlights the strong savoury flavours of the cheese and the beef. If you prefer your burger a little more ‘normal’ then opt for the simple Steak Forest (£8.95), served with a giant Portobello mushroom and basil pesto. The tang of the pesto works well with the earthiness of the mushroom for an unusual flavour that complements the richness of the beef. It’s certainly worth a try, although with so many strange and wonderful combinations you’re likely to be a while working your way through them. Don’t forget to factor in the price of sides as the cost of the burger covers just that. The skin-on chips (£3.25) are particularly good, with a pleasant rustic taste, while the gherkins (£1.50) are fat, juicy and so vinegary you'll do that face. You know the one. 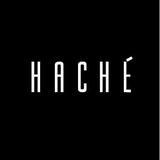 Haché does have an alcohol licence and so they offer a handful of red and white wines, reasonably priced at between £12.95 and £25.95 - including even three bottles of champagne. However, beer seems to be more popular, with bottles of Becks, Corona, Hoegaarden, Stella and Peroni all included on the menu. If you aren’t up for an alcoholic drink then their smoothies and milkshakes are a must. And no, they aren’t hideously bad for you. The Banana Berry smoothie tastes sinfully sweet but is made with natural yogurt, Wildflower Honey and apple juice, and is a pretty hefty drink for just £3.75. With residents getting increasingly agitated at the state of Clapham High Street, it’s good to see a fresh, new and affordably upmarket restaurant opening in the area. More of the same, please.